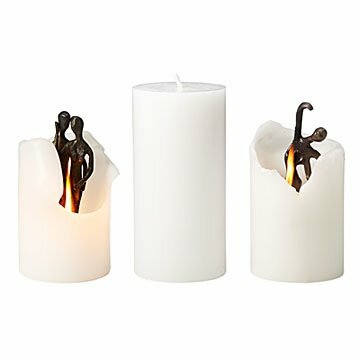 These spirits candles reveal a cast iron sculpture as the wax around them melts away. Hidden inside these inconspicuous-looking white pillar candles is a cast iron sculpture that's only revealed as the wax burns away. While it may be tempting to hold a marathon candle burning session for a more immediate reveal, the candles' mysterious charm relies on patience: slowing down to reflect and savor each moment as the candle burns gradually and the figure, slowly but surely, emerges from its waxy encasement. Available with your choice of Dance, Embrace, or Nurture sculptures formed by a lost-wax casting process, the unscented candles make an illuminating gift to celebrate a wedding, engagement, anniversary, or other milestone. And while the sculptures themselves may become blackened by smoke and flames as the candle burns around them, they can later be polished and kept as keepsakes once the wick reaches its end. Made in China. Never leave burning candles unattended or near flammable objects. Always place burn candles on a suitable holder or dish. Each candle is estimated to burn for 20 hours. Thoughtful, creative, beautiful and useful gift... And, with the romantic little sculpture to be revealed from within, the candle also provides a lovely memento of the occasion. Such a lovely gift that I would buy again! This product was great! I loved it! So simple and suprising! It's a bit smaller than I thought it would be. Still it'll be fun to see the candle burn down into the cast iron design. Great concept. Hope you make more with different choices! Use to decorate and lighten up a room. Beautiful design and romantic touch with the statues in the middle! My friend loved it and said she looks forward to seeing the statue inside.